Ananka's Diary: Giant Rat Captured! Imagine THAT scurrying past you in the darkness. More here. I will probably have nightmares with this 'adorable' creature. *shudders* Rats are sooo gross! I'm with Isabela, this thing will probably give me nightmares (rat nightmares are some of the worst). Thats disgusting! it must be 5 times the size of the the ones we used to have in our loft....its bigger than my chihuahua! oh, and i'm linking you, i hope thats all right?? i dont really blog about the same stuff you do, but that doesnt really matter. That's so cool. Maybe the government could breed a trained rat army. am I the only one who thinks this is adorable and slightly tragic? 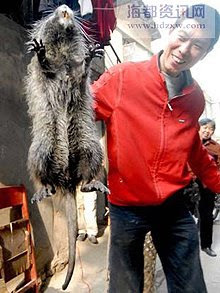 Rats are SOLD IN CHINESE BUTCHERS? EWWWWWWWW!!!!!!!!!!!!!!!!! Rats are ALWAYZ hangin around in sewers! HEY RATS R SOOOO NOT GROSSS! i have two adorable, smart, beautiful little ones and they are soooooooo misunderstood. i doubt that a reverse pied piper would work on that baby! Oh no! My secret identity has been captured on camera! to Dakota Blue: it might work as a mop...or a street sweeper. Oh my. I like rats though. I used to live with about 33 cats, and when I was very small I woke up early and walked into our kitchen to find every single one of them sitting somewhere in the kitchen twitching their tails and staring at a dead rat lying in the middle of the floor. Must have been about 10 inches, and it was quite bloody.